If you share a document with others to view and edit, it can be helpful to know when they've taken some action on that file. You don't want to have to constantly check the file in hopes you can spot the changes. In App - You can receive notifications right within Word, PowerPoint or Excel, when people you've shared your file with make changes, edits, comments, etc. 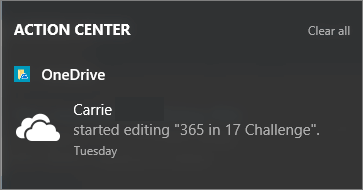 Notification Center - When your collaborators start to edit your file, you can receive a notification in the Windows 10 Action Center or in the notification center of your mobile device. Email - You can choose to receive an email notification when a change or comment has been made to your file. Let's take a look at how you can easily set up and use these notifications. The in app experience for notifications shows you which files have been changed and by whom. The exact experience can vary a little by app and platform. 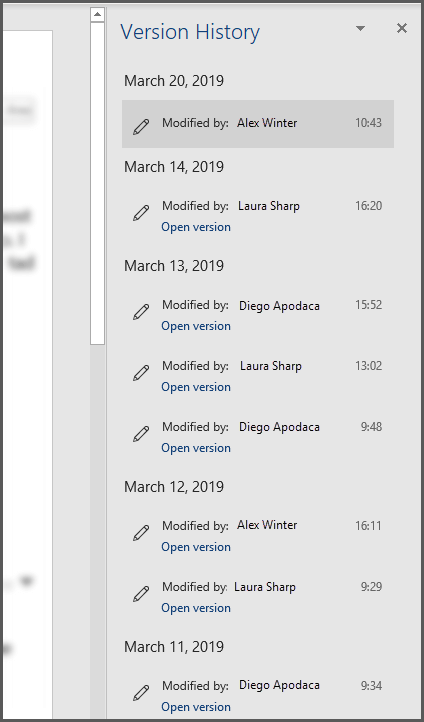 Office 365 has the concept of the Version History Pane for any documents stored on OneDrive or SharePoint. The version history pane shows you when your file has been saved, and by whom. To open it just click the document title on the title bar at the top of the window, and select Version History. If you share a slide deck in PowerPoint for Office 365, or PowerPoint Online, and other people make changes to the file you'll be notified with a small banner that lets you know who has made changes to your presentation while you were away. If your file is stored on OneDrive, you will get alerts in the Windows 10 Action Center, or on the Notification Center of iOS or Android, when people start to make changes to your file. In order to enable this you have to have the OneDrive app installed and you have to be signed in. The OneDrive app is installed by default on Windows 10 and assuming that you've signed into Windows with your Microsoft Account, as most people do, you don't need to take any further steps to get these notifications. If you need to install the OneDrive app on your iOS or Android device you can download it, for free, from the app store. To disable alerts for all files you need to go into the settings for your OneDrive app. Right-click the OneDrive icon (looks like a white cloud) on the system tray of your task bar and select Settings. On the Settings tab you'll find a check box to enable or disable notifications. 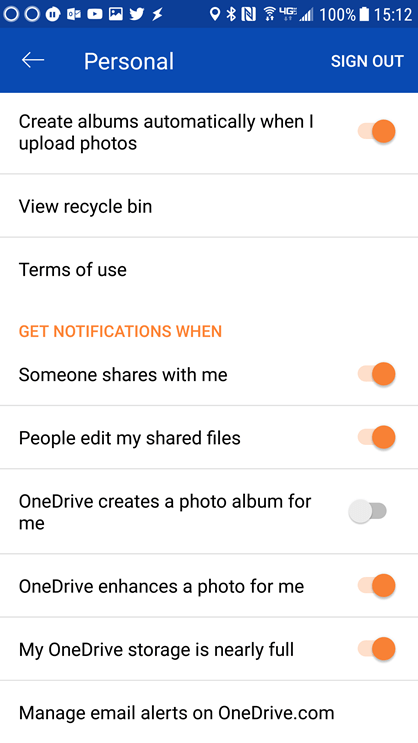 To disable alerts on your Android device, launch the OneDrive app, tap the menu at the top left corner and tap the Information button (looks like an "i" in a circle) at the top right of the dialog box that appears. The screen that appears will give you information about that account and options for turning on, or off, notifications for various activities, such as when somebody shares a file with you, or when they edit a file you've shared with them. 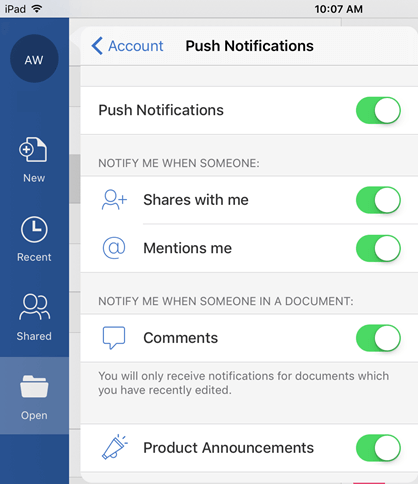 On this dialog box you can enable or disable push notifications for this app entirely, or enable or disable individual kinds of notifications such as Product Announcements or when somebody @Mentions you. Note that these notification settings are individual to the app. So you can choose to enable notifications for Word, for example, but not for Excel. This also means that if you want notifications in Word, Excel and PowerPoint you'll need to enable them in each app individually. To turn these notifications off, open your web browser and navigate to https://onedrive.live.com. Go into your document library and find the file that you want to turn notifications off for. Select it, then click the Information button towards the top right corner of the screen (or right-click the file and choose Details). Next to the file name at the top right of the information panel you'll see the notifications icon, which looks like a bell. Click that icon to turn off notifications for that file. For information on getting an emailed alert on documents stored in SharePoint see Create an alert to get notified when a file or folder changes in SharePoint. This article was last updated by Ben on April 4th, 2019 as a result of your comments. If you found it helpful, and especially if you didn't, please use the feedback controls below to let us know how we can make it better.